Princess Diana: Princess Diana And The Prince Who Would Not Be King! Princess Diana And The Prince Who Would Not Be King! Princess Diana's Son William Vows Never To Be King! Prince William shocked his father and the Queen when he declared that he doesn't want to and will never be king and will happily concede the honor to younger brother Prince Harry! The Queen was furious and told her son Prince Charles to snap his wayward son in line. Prince William has never forgiven The Windsors for the way they treated his mother and has never accepted the official story that she died of an accident. William was 15 when Princess Diana died so it is more than likely that she confided her fears of assassination to her eldest son. These days whether Prince William believes that his mother was murdered or not is anyone's guess, but four years after her death he certainly did not buy the tragic accident story. On the eve of the fourth anniversary of her death, as he knelt by her final resting place he swore to bring her killers to justice! The prince had confided in a number of friends that he had to do it for his mother. As she was pretty much scorned by the rest of the royal family, Princess Diana must have confided a lot of her dreams and fears to her oldest son, and that burden must weigh heavily on his shoulders. When he made the pledge to Princess Diana that he'd never rest until he found her killers, William took action by hiring an investigator from MI5 another spy branch of the British Secret Intelligence Services. The man he hired is retired from the MI5 and came highly recommended. 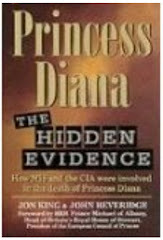 The investigator was highly placed within the agency and had access to very sensitive data, and most importantly never bought the story that Princess Diana's death was an accident! One aspect that always nagged Prince William was how come that night of all nights Princess Diana wasn't wearing her seatbelt! He of all people knew how obsessive his mother was about wearing seat belts, even when wearing formal gowns that would have been even more uncomfortable with a seatbelt on. Princess Diana extended her obsession of wearing seatbelts to her sons, insisting they alway put them on! Several investigative journalists have since determined that the seatbelts in the Mercedes in which Princess Diana died were all tampered with save for the one that saved Trevor Rhys Jones! Wow, that's what I was looking for, what a data! existing here at this blog, thanks admin of this web page.